What Size Rocks to Use in a Rock Tumbler? How Big? 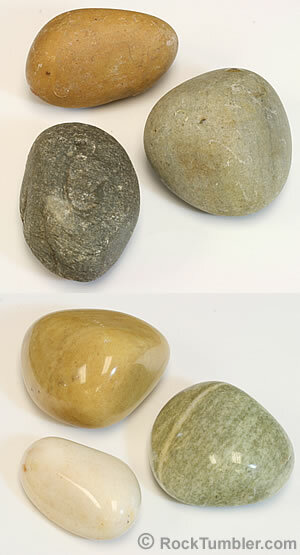 Home » Rock Tumbling Library » What size rocks should be used in a tumbler? What Size Rocks Should Be Used in a Tumbler? You should use a mix of rock sizes - none bigger than 1/2 the barrel diameter. The illustration above shows how small diameter material can increase the efficiency of your tumbling. In Figure 1A there are only a few large rocks in the tumbler barrel. Notice how there are only a few particle-to-particle contacts where grinding can occur. Small particles have been added in Figure 1B and they occupy the spaces between the large particles. Now there are a much larger number of particle-to-particle contacts where grinding can occur. 1) Load the barrel with a mixture of rock sizes. 2) Tumble rocks no larger than 1/2 the barrel diameter. The first rule is one that everyone should follow. The second is for people who want to make "monster" tumbles (described in more detail below). For small tumblers with a three-pound capacity barrel such as the Thumler's A-R1 and Thumler's A-R2, a mix of rock sizes between 1/4" and 1 1/4" is recommended. The action produced in these small-diameter barrels is adequate to shape a rock up to an inch or a little more in size. For larger tumblers such as the Thumler's A-R6 and Thumler's A-R12, small pieces of rock are still required for efficient grinding and polishing. However, these tumblers can perform well with rocks between 1 1/2" and 2" in diameter. Producing large tumbled stones with a spectacular appearance requires careful rough selection and a lot of patience. Don't waste your time tumbling a big piece of "junkite." 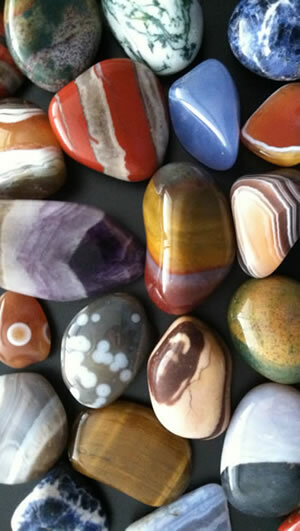 Instead, pick a nice jasper with great color or a big piece of Brazilian without any hint of fractures. Good luck! Grinding in the barrel of a rock tumbler occurs at points of contact between two pieces of rock. Tiny grit particles caught between these pieces of rock scratch the rocks and remove small bits of material. If there are only a few points of contact between the rocks, then very little grinding will occur. However, increasing the number of contact points will increase the amount of grinding. Figure 1A at the top of this page shows a barrel with several large rocks. Notice how there are only a few points where these rocks are in contact with each other. If you tumble a load that contains only large rocks, very little grinding will occur. The large rocks will also hammer one another as they tumble and chipping or breakage can occur. Figure 1B shows a barrel with a range of rock sizes. Notice how the tiny rocks occupy the spaces between the large rocks. Also notice how many points of contact there are between the rocks. There are many more points of contact in this load, and when it is tumbled a lot more grinding will occur compared to the rocks in Figure 1A. This is why loading your tumbler barrel with rocks in a range of sizes is highly recommended. We always have lots of rocks of various sizes on-hand that that we can add to a tumbler barrel to adjust the mix of sizes. We also have lots of ceramic media on hand if we need a generous amount of small material. 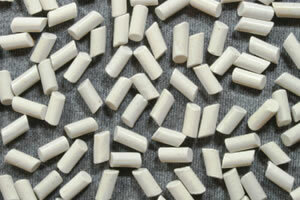 Small ceramic media: These angle-cut ceramic cylinders are about 3/16" diameter x 3/8". They work great when you need some small-size material to balance the particle size load in your tumbler. They also work well when you have a lot of flat or angular rocks that tend to slide in the barrel instead of tumbling - they get between those rocks and serve as roller bearings! Ceramic media (also called ceramic pellets) is used in rock tumbling as a filler and as a substitute for small-size material. If the rough that you plan to tumble is all 1" pieces then you will need some small particles to fill the spaces between them. These small particles will produce additional points where grinding will occur. If you don't have small-size rough for this purpose you can add some small ceramic media. The most often used ceramic media shape is an angle-cut cylinder. These cylinders turn into "roller bearings" in the tumbler barrel and do a great job of moving your rough around and delivering grit to irregularly-shaped rough rocks. They can be washed with your rough between tumbling steps and accompany the rough through every step of the tumbling process. Even if you don't need small material, a small amount (several percent by weight) of small ceramic cylinders can improve the action in a tumbler barrel. They are especially effective in vibratory tumblers when your rough consists of a lot of flat or blocky shapes. We use them frequently. See our article on how to use ceramic media. We purchased a 40-pound bag of quartzite cobbles at Home Depot. They were all about three to four inches in diameter. Most of them were not tumbling grade, but we find a couple dozen with potential. We tumbled them two or three at a time in a Thumler's Model B tumbler with lots of ceramic media and smaller rocks. We ran them in the Model B for over a month to grind off the weathering rind. We then ran them in medium, fine and TXP polish in a Thumlers U-V10 vibratory tumbler - again two or three at a time with a full barrel of media and smaller material. The results were awesome! The green one with the healed fracture is one of our favorite tumbles of all time. Some people like to make very large "monster" tumbled stones. These can be made if you have a lot of patience and are willing to run these large stones through the coarse grit grinding step several times. It can take several weeks for these rocks to become nicely rounded and smooth. If you have patience you can easily tumble rocks that are up to about 1/2 of the diameter of your tumbler barrel. Just don't put too many of them in the barrel at the same time - perhaps one or two. If you add too many large rocks to the tumbler they will crush your small material or break one another as a result of the impacts that occur in the barrel. Select your rocks carefully if you plan to make monster tumbles. Avoid any with deep indentations because those indents will take a very long time to wear smooth. Also avoid rocks that have any signs of a fracture - and check for fractures each time you open the barrel. Don't waste a month of tumbler time on a piece of junkite! We usually polish our largest tumbles in a vibratory tumbler such as the Thumler's U-V10 or the Thumlers U-V18. We place two or three of them in the bowl and cover them with lots of ceramic media and small tumbled stones. Don't include any fragile materials in the barrel with them. Obsidian, feldspar, and even crystal varieties of quartz can be severely bruised, cleaved or broken if they are tumbled with large rocks. The instructions supplied with the Lot-O-Tumbler say that it will tumble any rock that you can fit through the opening. We have used the Lot-O-Tumbler to produce a few 2" diameter tumbles that were brought to a round shape in a rotary tumbler. We polish all of our large tumbled stones in TXP aluminum oxide polish. Its the polish that we use for almost everything.